Providing a review of the successes and impact of the University’s fundraising during 2016 – including the conclusion of the highly successful Beyond Campaign – the magazine reflects how alumni, trusts and foundations, local and international companies and non-graduate supporters are making a huge difference to life at Queen’s. In his foreword, the University’s Vice-Chancellor, Professor Patrick Johnston says: “However much you give – whether in terms of expertise or financial support – your contributions enable us to offer our students and staff a wealth of opportunities at a world-class Russell Group university. 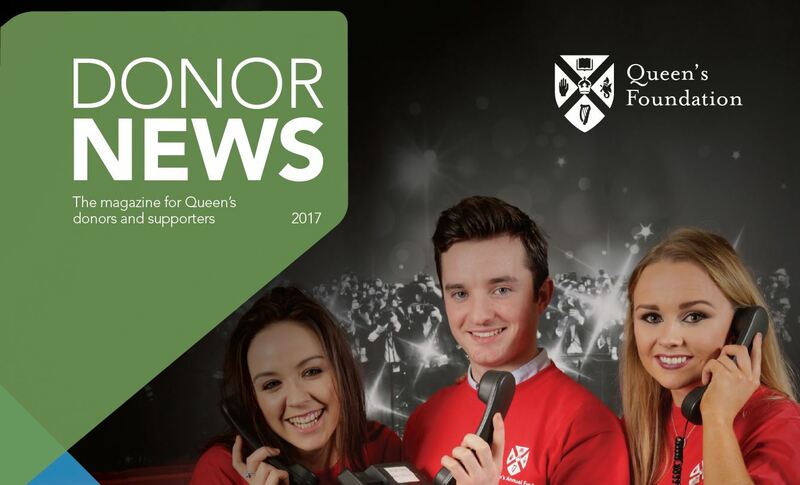 In addition to a celebration of the Beyond Campaign, the current issue of Donor News features an in-depth interview with Jim Rutherford, who took over as Chairman of The Queen’s University of Belfast Foundation Board last year. The impact of individual contributions, scholarship funding and corporate gifts on current students and staff also features large in this year’s magazine. This issue also includes news of the current medical fundraising campaign, a profile of donor and volunteer Roy Bailie, plus articles on volunteering, Queen’s Annual Fund and the importance of legacy planning. As Editor Gerry Power points out however, it is primarily a publication to acknowledge all those who support the University. “Donor News gives us a chance to say thanks – on behalf of all those students and staff – who have benefitted from the wide range of generous gifts received by the University in the last year. “The University relies on individuals, corporations and trusts for regular and one-off gifts to enable it to deliver the best student experience possible and to push forward the boundaries of our research. As stewards of those gifts the Queen’s Foundation – through the Donor News – gets a chance each year to say ‘thank you’ to some very special and important people. “There is much to celebrate and to report on, but more than anything we want our donors to know that their donations really do make a difference,” he added. If you'd like to make a gift to Queen's, or to find out more about the areas of University activity that need your help, please click here or call +44 (0)28 9097 3114. Inquiries to Gerry Power, Communications Officer/Editor Donor News, Queen’s Development and Alumni Relations Office; tel: +44 (0)28 9097 5321.